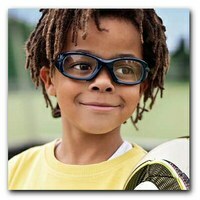 Scott & Christie and Associates would like to bring awareness to Sports Eye Safety during the month of April. Ninety percent of all sports related eye injuries can be prevented with the proper safety equipment. Proper eye safety equipment does NOT include Prescription glasses, sunglasses, or even occupational safety glasses. Each sport has its’ own recommended methods to protect your eyes from any harm. Below are some of the major sports and the ways to protect your eyes while playing them. HOCKEY: Helmets are a requirement during hockey. It is HIGHLY recommended that a player also wear a polycarbonate eye guard to protect from various eye injuries. BASEBALL: Fortunately for catchers, they are required to wear a face mask to protect their eyes. For all other players it is recommended to wear protective safety glasses to avoid any eye injury. FOOTBALL: Football players are already required to wear helmets during play, but some of these helmets do not come equipped with protective guard for the eyes. Being the football is a contact sport, fingers to the eyes are a common injury. A protective guard is the best way to prevent these kinds of injuries. BASKETBALL: Although basketball is not a contact sport, fingers to the eyes are also very common. The best way to protect against these injuries is to wear protective eyewear during play. SOCCER: Soccer is another sport where fingers to the eyes occur frequently. Protective Eyewear is once again the best way to protect yourself from these kind of injuries. If you have any questions or inquiries regarding safety during recreational activities, please contact us at Scott & Christie and Associates for more information.